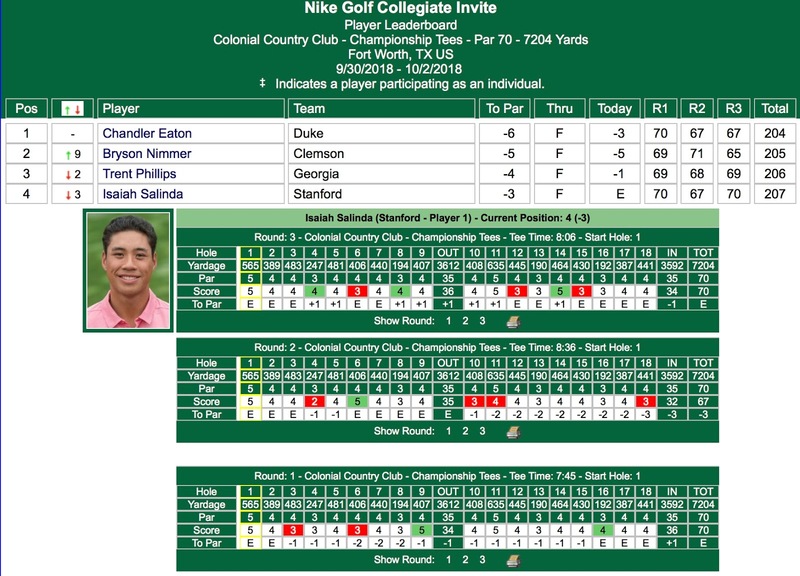 FORT WORTH, Texas – Isaiah Salinda recorded his second-straight top-20 showing on Tuesday to pace No. 20 Stanford to an eighth-place finish at the Nike Collegiate Invitational at Colonial Country Club. A senior from South San Francisco, California, Salinda registered rounds of 70-67-70 to conclude at 3-under 207. He tied for 16th in the season-opening OFCC/Fighting Illini Invitational. 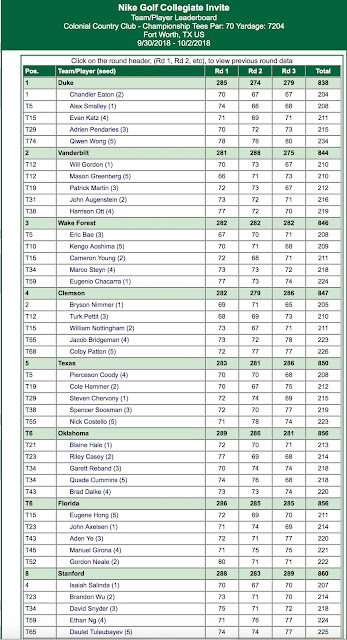 "Guys hung tough today in some very challenging conditions," said Conrad Ray, the Knowles Family Director of Men's Golf. "The greens were faster and the rough was thick. There was a huge premium for hitting the fairway, which we could have done more of in the tournament." Competing against a stellar, 15-team field at historic Colonial, the Cardinal posted rounds of 288-283-289 to complete play at 20-over 860. Duke won the team title with a score of 2-under 838. Chandler Eaton of the Blue Devils captured medalist honors at 6-under 204. Salinda carded three birdies and three bogeys in the final round. It marked the seventh top-10 finish of his career and 12th top-20. "Isaiah was a strong leader for us this week and had a great chance to win individually," Ray said. Senior Brandon Wu (73-71-70) also performed well, earning a share of 23rd at 4-over 214. After slipping 2-over through five holes, he played the last 12 in 2-under. Junior David Snyder (75-71-72) tied for 34th at 8-over 218. Freshmen Ethan Ng (71-76-77) and Daulet Tuleubayev (74-74-77) tied for 59th and 65th, respectively, at 14-over 224 and 15-over 225. Next up for Stanford is the Jack Nicklaus Collegiate Invitational, October 8-9 at Muirfield Village Golf Club in Dublin, Ohio. The course annually plays host to the PGA Tour's Memorial Tournament. "With some good work the next few days, we are eager to get to Muirfield and put it back to the test next week," said Ray. 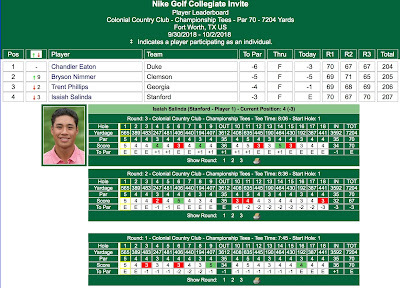 FORT WORTH, Texas – Senior Isaiah Salinda matched par with a 70 to spark Stanford in the opening round of the Nike Collegiate Invitational on Sunday at Colonial Country Club. The No. 20 Cardinal is tied for ninth in the 15-team, 54-hole event. Salinda carded two birdies and two bogeys to earn a share of eighth place. Freshman Ethan Ng (71) is tied for 19th, senior Brandon Wu (73) is 37th, junior David Snyder (74) is 47th and freshman Daulet Tuleubayev (75) is 55th. 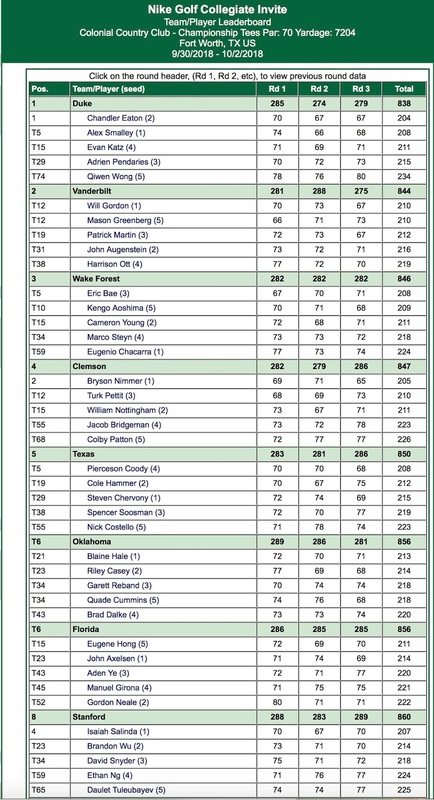 Vanderbilt, paced by individual leader Mason Greenberg (66), is the first-round front-runner in the team competition at 1-over 281.